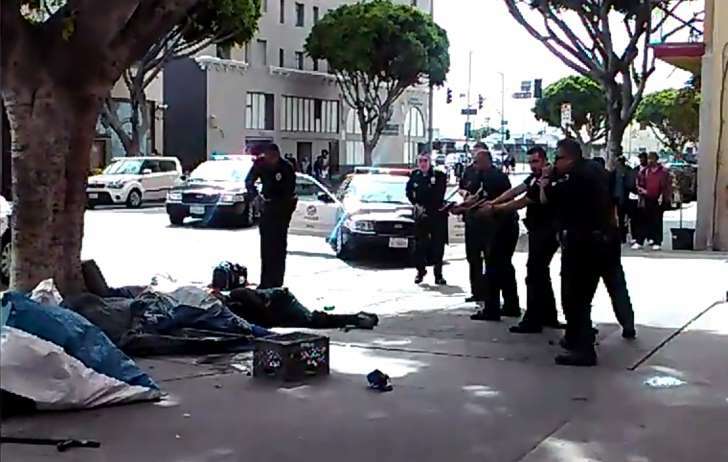 LOS ANGELES — In a dramatic confrontation caught on video, Los Angeles police shot and killed a homeless man in the heart of downtown's bustling skid row Sunday. A video of the incident posted on Facebook shows a group of officers getting into a scuffle with a man standing on a sidewalk littered with tents and other debris. During the struggle, one officer drops his nightstick, which is picked up by a woman on the street. Two officers handcuff the woman. The man continues to scuffle with four of the officers, even after he's wrestled to the ground. One of the officers is heard saying "Drop the gun. Drop the gun." Then, at least one of the officers opens fire on the man, who remained on the ground with at least two officers near him. Five gunshots are heard on the recording. Police have not identified the dead man or said how many officers were involved, or how many shots were fired. The man was declared dead at a hospital shortly after the shooting, which occurred about noon, according to police spokesman Sgt. Barry Montgomery. The officers had responded to a robbery call in the 500 block of San Pedro Street, Montgomery said. He added that at one point during the struggle a Taser had been deployed, but investigators did not know if it struck the man who was subsequently shot. No officers were injured during the altercation, Montgomery said. Witnesses at the scene identified the victim by his street name, "Africa," and gave conflicting accounts of what they saw. Dennis Horne, 29, said Africa had been fighting with someone else in his tent when police arrived. When Africa refused to comply with a police order to come out of the tent, officers used the Taser on him and dragged him out, Horne said. The officers tackled Africa to the ground, where he continued to fight, which led to the fatal shooting, according to Horne. "It's sad," Horne said. "There's no justification to take somebody's life." Another witness, Lonnie Franklin, 53, said five to six officers pulled up in three to four cars as Africa was lying face down on the sidewalk. The officers approached with guns drawn yelling, "down, down," according to Franklin. When Africa got up and started fighting, the officers "went straight to lethal force," Franklin said. But Jose Gil, 38, said he saw the man swinging at the police and then heard one of the officers say, "Gun, gun, he's got my gun!" before police fired multiple shots. Another witness, who asked not to be identified, said the man punched and kicked the officers and reached for one of their service weapons before the officers fired at least seven times. An area resident, who identified himself as Booker T. Washington, said police had come by repeatedly to ask Africa to take down his tent. People are allowed to sleep on the streets from 9 p.m. to 6 a.m., but they are supposed to remove their tents in the daytime, under a court agreement. "This man got shot over a tent," Washington said. Ina Murphy, who lives in an apartment nearby, said Africa had arrived in the area about four or five months ago. He told her he had recently been released after spending 10 years in a mental facility, Murphy said.